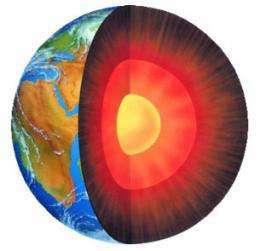 An artist's conception of Earth's inner and outer core. A trio of researchers in Denmark has calculated the relative ages of the surface of the Earth versus its core and has found that the core is 2.5 years younger than the crust. In a paper published in the European Journal of Physics, U I Uggerhøj and R E Mikkelsen with Aarhus University and J Faye with the University of Copenhagen, describe the math involved in their effort and their results. During one of his famous lectures at Caltech in the 1960's, Richard Feynman remarked that due to time dilation, the Earth's core is actually younger than its crust—a difference he suggested that was likely a "day or two." Since that time, physicists have accepted both the notion that the core is younger than the surface, and the amount of time given by Feynman, without checking the math. General relativity suggests that really big objects, like planets and stars, actually warp the fabric of spacetime, which results in a gravitational pull capable of slowing down time. Thus, an object closer to Earth's center would feel a stronger pull—a clock set near the core would run slower than one placed at the surface, which means that the material that makes up the core is actually younger than the material that makes up the crust. This seems counterintuitive to our sense of reason. Such oddities have long been taken for granted in physics, as has the degree of time difference offered by Feynman during his lecture. In this new effort, the research trio ran the math to discover the actual number involved. They found that over the course of our planet's 4.5 billion year history, the pull of gravity causes the core to be approximately 2.5 years younger than the crust—ignoring geological processes, of course. The findings by the team not only serve as an example of the influence of gravity over time, but the problems that can arise when scientists take the words of famous colleagues at face value, simply because of their prestige. No one should be above review, of course, which, as many who knew Feynman can attest, was one of his mantras. I don't get what they are saying here, do they want to talk about the speed of time or a time difference? A new way of driving down costs? Store it in a gravity well and it stays fresh for longer? @kedas, I'll stand corrected, but "liquid" in terms of the core doesn't much resemble our everyday experience of the term. The "liquid" that most resembles the core in our everyday experience is glass. I would expect physical.org to be the last place a clickbait headline would rear its head yet here it is. In four and a half billion years 2.5 years younger is NOT "much" younger. If anything the headline should have said "slightly" younger. Please restrain yourself from hyperbole in the future. Actually, due to the speed of time there, slight difference that it is over the 4+ billions years the planet has been around, a 2.5 year difference is fairly significant, especially as it shows part of how the Universe, gravity and time all happen to work. Also, it has been shown that a large part of the core is NOT a liquid, rather it has been crystallizing out from it's high pressure super saturated state. While it is thought that the core is mostly nickle-iron, that does not allow for the heavier elements such as gold, platinum, lead and the whole slew of radioactives. It is only once one gets above this central core that one can actually talk about the materials being in a relative liquid state. Actually, it is entirely possible, during the past 4 billion years or so of having a fairly stable, chemically reactive environment where life (not as we know it) could form and live on a very different size and time scale than ourselves. The chemistry is there. This is the same reason why your feet look younger than your face. @antigoracle: one wonders how much study there has been into the onset of senility and dementia in tall people as opposed to short ones, and probably taking into account, the oblateness of the Earth and latitude. One might also make a case for leg amputations in the quest for extended mental dexterity later in life, or if one were to draw the line at that, perhaps to adapt to spending more of one's time horizontal, and perhaps walking quadrapedally. Or, we can compare midgets and basketball players of the same age. Can anyone say - Naptime...? So, the question becomes, would a graph of the "gravitational well" which accounts for heading towards the center of a large body still be a roughly bell shaped curve or would it be shaped more like the classical bell shaped "gravitational well" idealized for essentially point masses but as soon as you go below the surface the curve reverses to no well at all once you reach the center of the mass? As a different example, if an object was at an L1 Lagrange point between the Earth and the Moon, would it have the same time dilation effect as if the Earth and the Moon weren't there? So, if there is no resultant gravitational force at the center of an idealized Earth (nothing is perfect!) then the center of the Earth should actually be older (not younger) than the surface of the Earth as the surface of the Earth has the gravitation of the whole Earth affecting it! Geez, I thought they were talking about geologically younger. The calculations are interesting, I suppose. OK, I read the author's paper, brushed up on gravitational force within spherical shell [ https://en.wikipe..._theorem ] vs. gravitational potential within a spherical body [ https://en.wikipe...otential ] (not the same thing for - sheepish look). I retract. Sorry. You should learn to read. Then you might stand a chance of not making a fool of yourself again. While the gravitational ACCELERATION at the Earth's Center is roughly zero, the gravitational Potential is much higher than at the surface. It is this potential which results in time dilation. Actually, it's just the opposite. Stronger net gravity field = more time dilation; and you will note that they're saying that the Earth's core is *younger* implying that there is more time dilation at the surface than at the core. The net gravity field is *less* at the core due to the shell theorem. And it's the net gravity field that makes the time dilation. What I don't pretend to understand is whether the calculation they've done includes all relevant General Relativistic terms affecting time dilation. ... Any comments from someone who has a handle on this? I had a look and all they did was account for density; they didn't bother with heat or stress. They did have a look at time dilation on the surface due to the Earth's rotation but it was on the close order of 10^-5 years and they comment that's "negligible" in the paper. I expect the stress and heat terms would be of similar or even smaller order. It's the mass that does most of the gravitating; energy, whether heat or stress, is of lesser gravitational influence by a factor of c², as we all know from the famous equation E = mc². The big factor seems to be the density gradient. Also worthy of note, the amount of time dilation here is microscopic; it's on the order of 10^-9 at 1G on the Earth's surface. It takes really, really strong gravity to make much difference. You are both correct an object in the center of a gravity field would be weightless while at the same time the gravitational field and time dilation would be at its maximum. 2.5 years is not much younger, it is insignificant. The real issue is how anything related to geology can be known to 2.5 parts in approximately 4.5 billion parts. The paper upon which this paper is based is only an exercise in mathematics and, as such should be considered only is this context and doesn't relate to the actual geologic processes. This further means that the author of the article in Phys.org (Bob York) should be shamed for his hyperbole. I meant Bob Yirka, not Bob York. Please excuse me for not being more careful in my attribution. They said "much younger than THOUGHT". We THOUGHT it was a day or two. It turns out its 2.5 years. Which in comparison to a day or two is MUCH younger. Be careful people. There is a difference between being younger and aging slower. I am nit sure why the physically correct comments like Steelwolf's are voted down, but it is a check on general relativity and Feynman both. The simplest here is actually to study classical GR. I would therefore have assumed that they just bothered with the mass term; it is nice that they checked mass energy of rotation too. So it isn't about geology, but FWIW it is believed from state observations of iron and thermal models of the core that it has is now solid in the center. [ctd] The effect for the Sun core is 40 kyrs! It is also not (directly) about the behavior of masses at the center. But yes, by the classical field approximation a mass at the center of a massive sphere is weightless. By hydrostatic behavior of Earth the small deviation from a sphere would not affect that much. But there would be some residual tidal effects pulling at the mass, so it can't be expected to stay at the center. Unless the core is solid of course, but in reality the tidal effects would move around the whole core some. Does this mean Chris Christie ages slower than the rest of us?